‹ New Audio Conference Available! Lessons from Koontz v. St. Johns River Water Management District: Game Changer or Just a Little Rule Refinement? July’s Distribution is out about a week earlier than last year, but the distribution was still up 5.9% at $37.92 million, compared to $35.82 million last year. 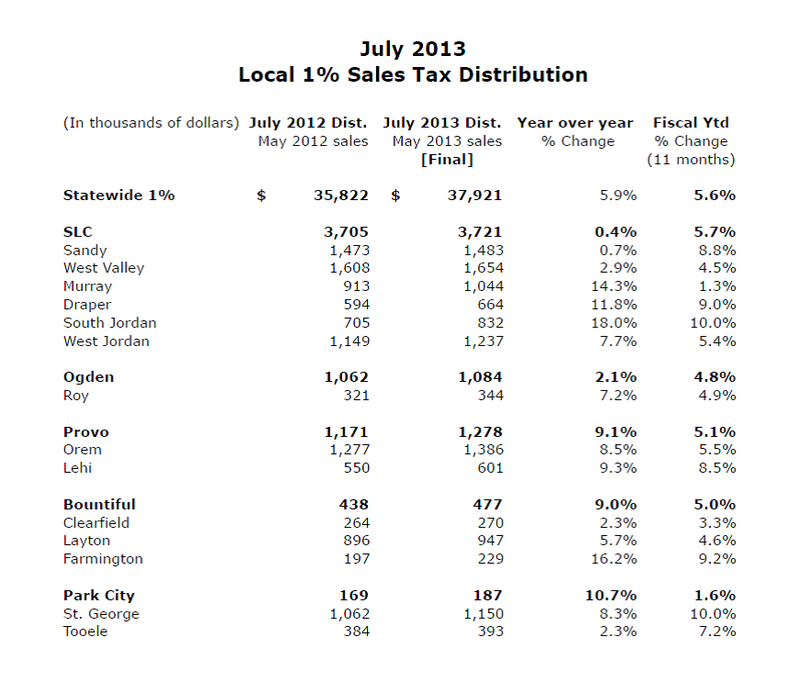 July’s distribution of the 1% local sales tax represents sales largely from May monthly taxpayers. Across the nation car and truck sales were strong as was new home construction. 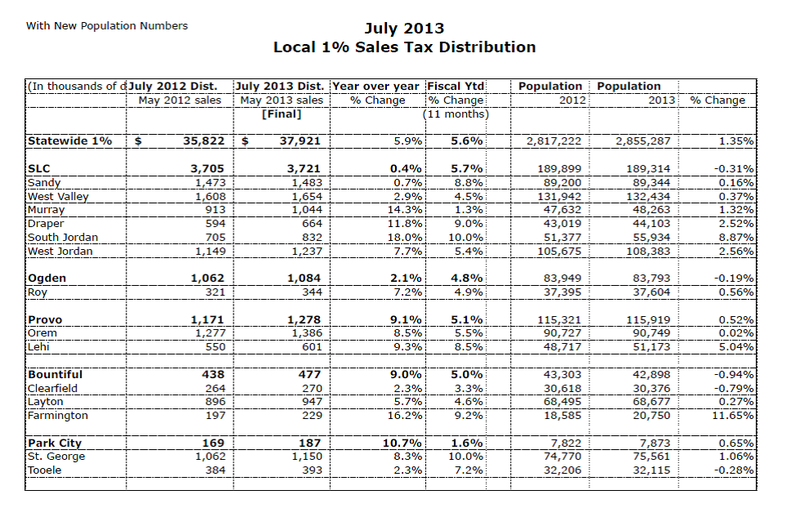 Several large cities did not fare as well as some medium size cities in the July distribution. For example, Salt Lake City (0.4%), Sandy (0.7%) and Ogden (2.1%) did not perform as well as Draper (11.8%), South Jordan(18%). We initially thought this might be due to the use of the 2013 population numbers in the 50% population/ 50% point-of-sale distribution formula, which were inserted into last month’s distribution. But this does not explain all the variation, so most of the difference must be due to May’s point-of-sale performance. I added a table with population so you can check out the new 2013 population differences. Just subtract how much your population percent change is from the statewide percent change and divide by 2 to estimate your monthly impact. For example, Lehi’s growth of 5.04% less the statewide average of 1.35% divided by 2 equals a monthly increase of 1.85% in FY2014 for Lehi. See the second chart below. Hope this helps. 5.9% is close to our forecast.